Adults are small, round or oval. Golden, green, or brown, respectively. 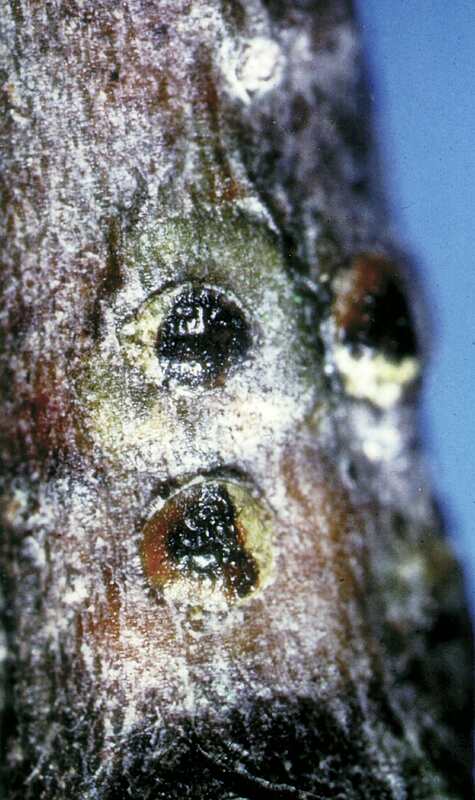 They are found in pits on bark. While crawlers are very small, yellow, seldom far removed from adult. White and black oaks are favored and found throughout Eastern and Western United States and must have the proper host. Sunken pits are seen in bark of twigs and limbs where adult is feeding; dieback of twigs and branches. Continual heavy infestation may kill the tree. There is one generation annually. Adults overwinter on twigs, and produce living young during spring and summer. Crawlers seldom far from parent, generally colonizing on current season and one-year old wood. After settling to feed, nymphs never leave that site. Maturity is attained several months after feeding begins.